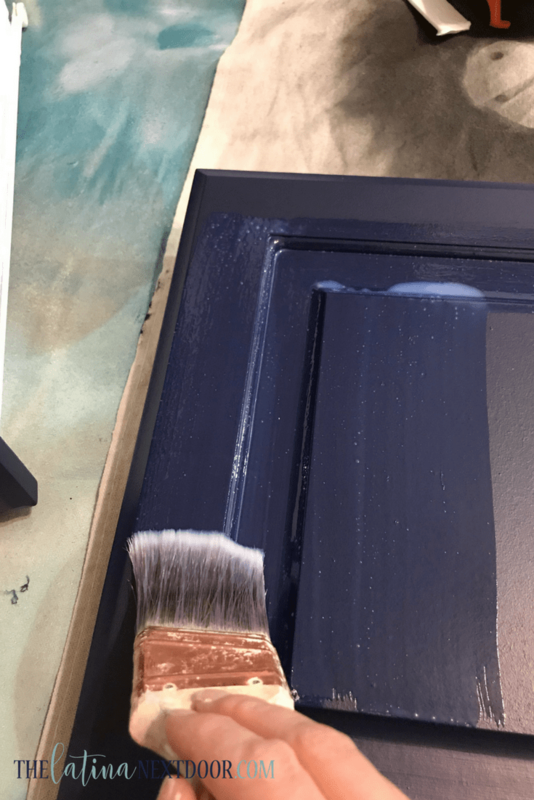 Every year several bloggers and business owners join together for National Paint Week which is hosted by Sherwin Williams. This year I was honored to be a part of it and share a project for inspiration. For more information and inspiration go to the National Paint week official page here. This bathroom is for our young boy. The previous homeowners painted the walls dark, kept the original builder grade fixtures and wore the cabinets out over time. 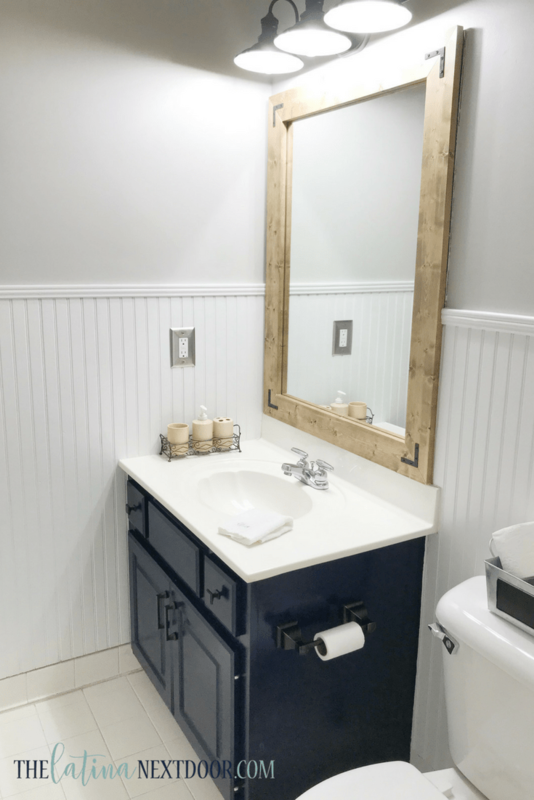 This bathroom was made over to create a farmhouse feel with masculine touches but kept light walls since the room has no natural light. The light fixture was builder grade, along with the cabinet and pulls… and that poor cabinet had seen better days. 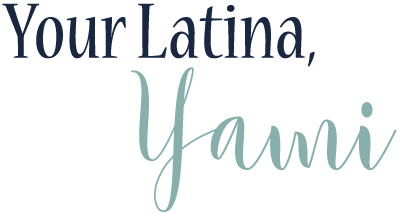 It definitely needed a facelift… STAT! 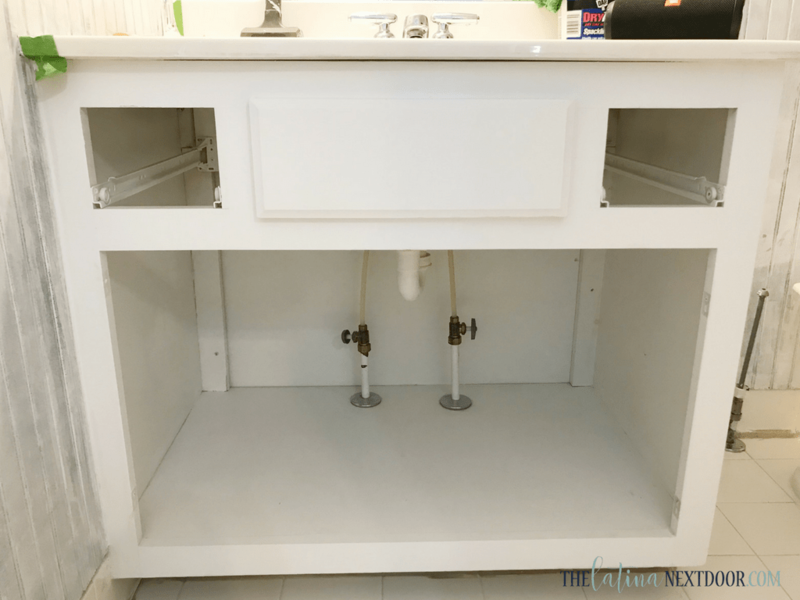 Our budget did not include a new countertop, faucet or floors, but we figured since they were in decent shape, we would hold off and tackle everything else for now. 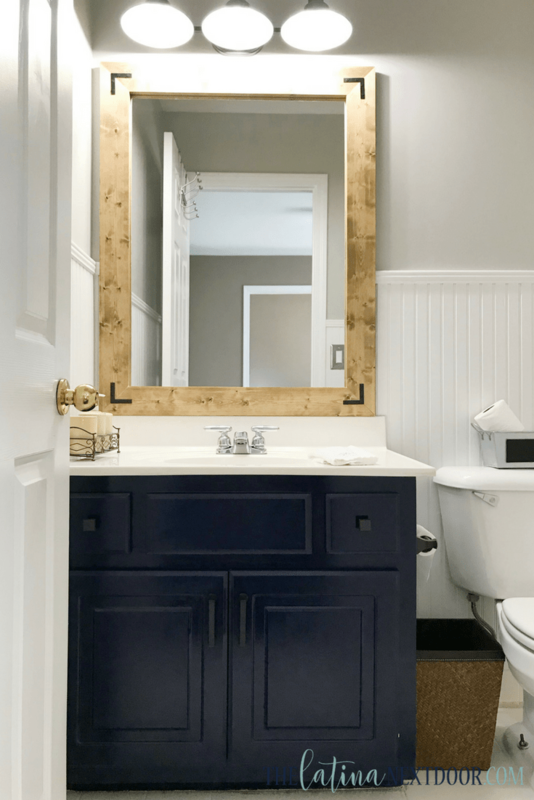 Remove all items from the bathroom and clean everything thoroughly. This includes walls, cabinets, floors etc. Remove all doors and cabinet pulls from cabinets and remove light fixture if you wish to replace it as well. Sand doors and cabinet to smooth any imperfections. 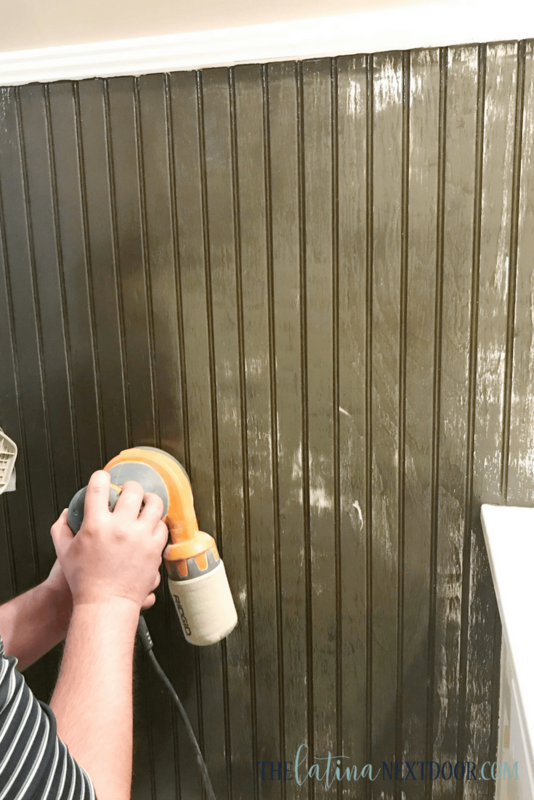 We sanded the wainscoting on the walls to remove some of the excess paint and paint drips and we patched areas with spackling in order to create smooth walls. 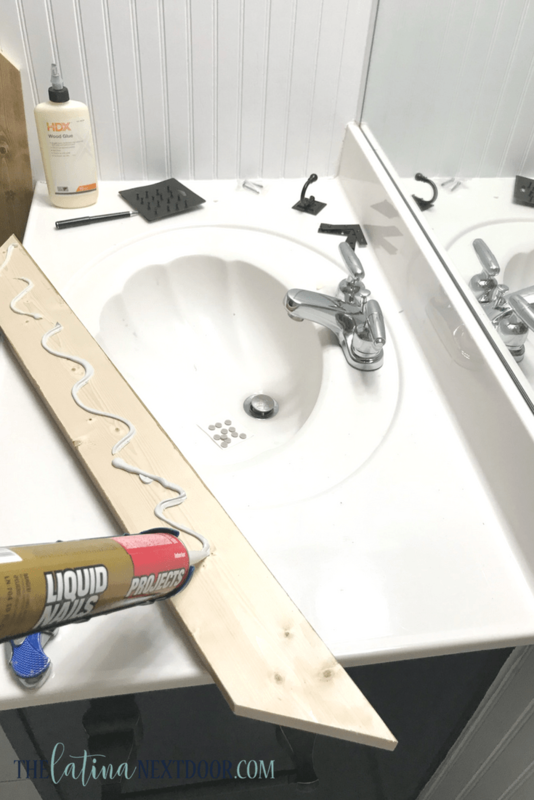 Also, if there are areas around the bathtub or sink that need to be caulked, go ahead and do that now. Prime the walls, cabinets and wainscoting if applicable ( sooooooo much primer!). One coat is sufficient though. 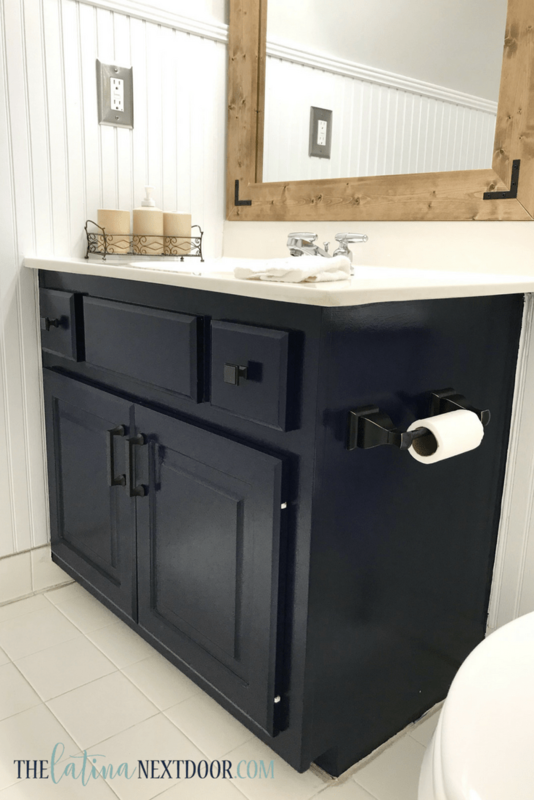 Paint the cabinet and doors with SW In the Navy in Satin. For this dark color we applied 4 coats (and in some places 5) for a smooth and even consistency. 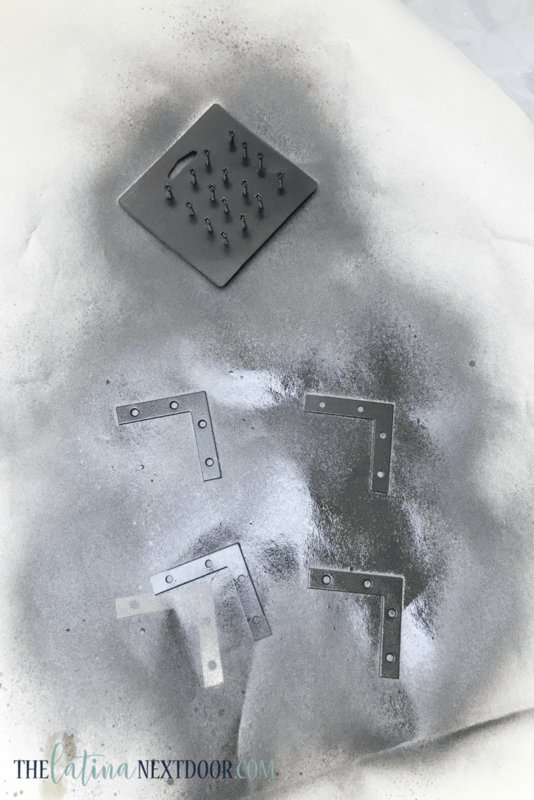 Let the paint dry completely in between coats. It will look terrible at first because it is such a dark color, but don’t fret, the more coats the better it gets! Hang in there! 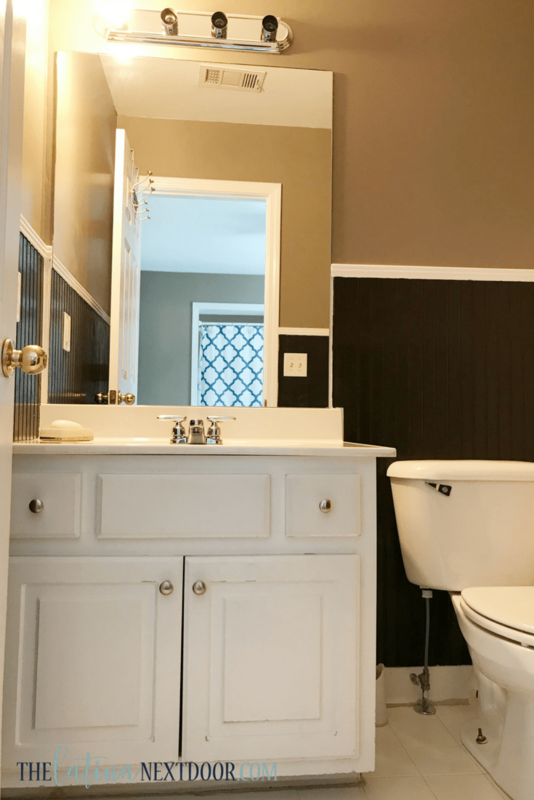 While painting the cabinets, paint the wainscoting Extra White. 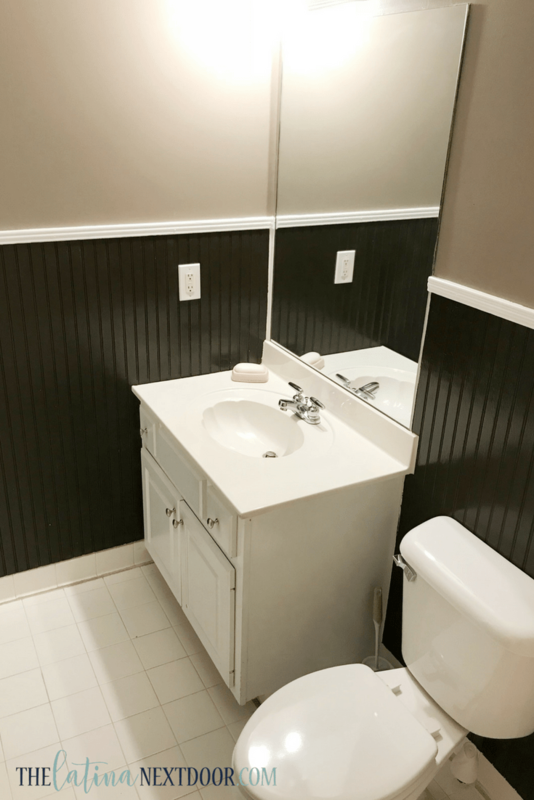 We used semi-gloss to match the rest of the trim in the house and for easy cleaning, especially in a bathroom. Apply two coats making sure to let dry completely in between coats. Tip: For the area behind the toilet, you can remove the toilet tank in order to make it more accessible and easier to paint. 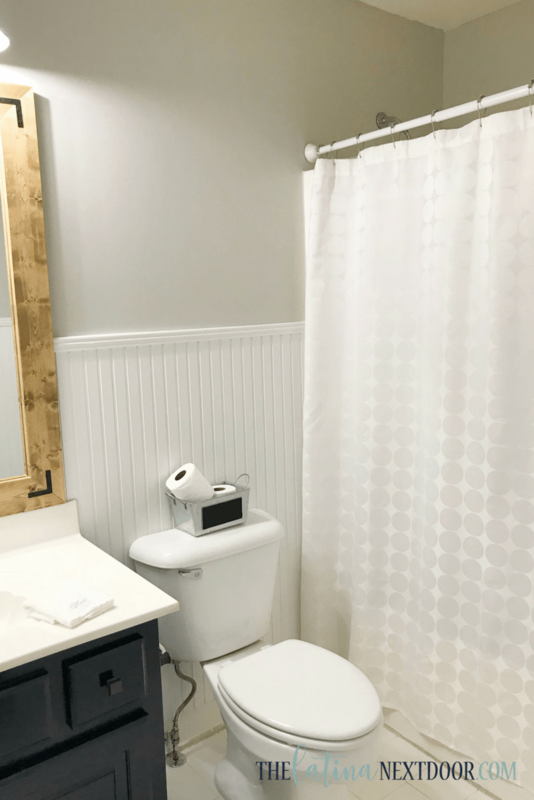 Since the bathroom has no natural light and is small in size, we decided to keep the top portion of the wall neutral and light so we chose SW Repose Gray (again in Satin since this is a bathroom). Apply two coats. 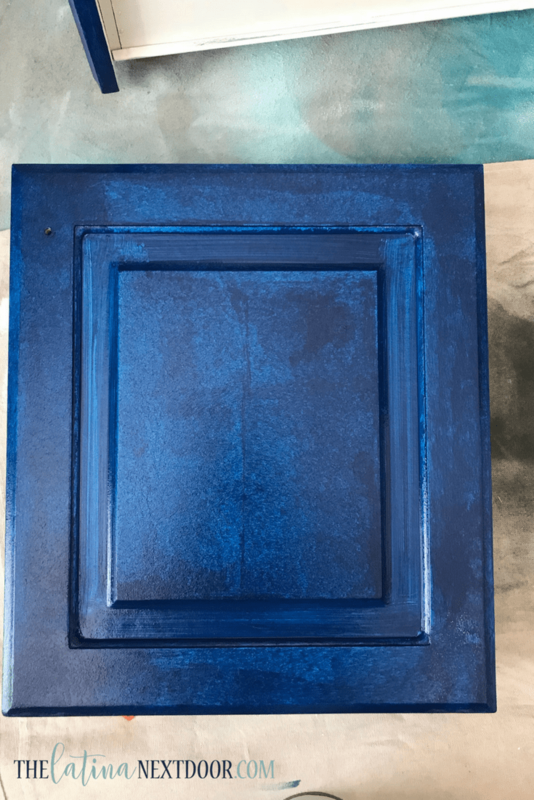 Once the cabinet is completely dry, use Polycrylic in order to seal the paint and create a protective barrier for your cabinet. 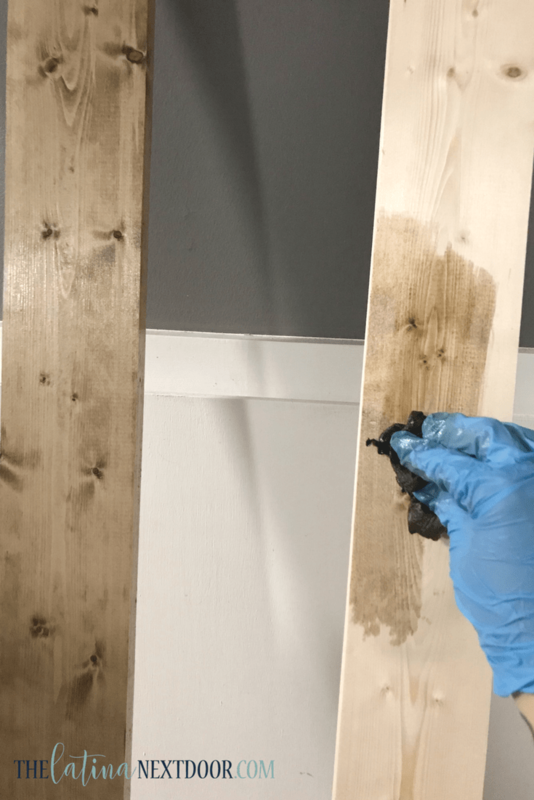 We applied 3 coats per the product recommendation. 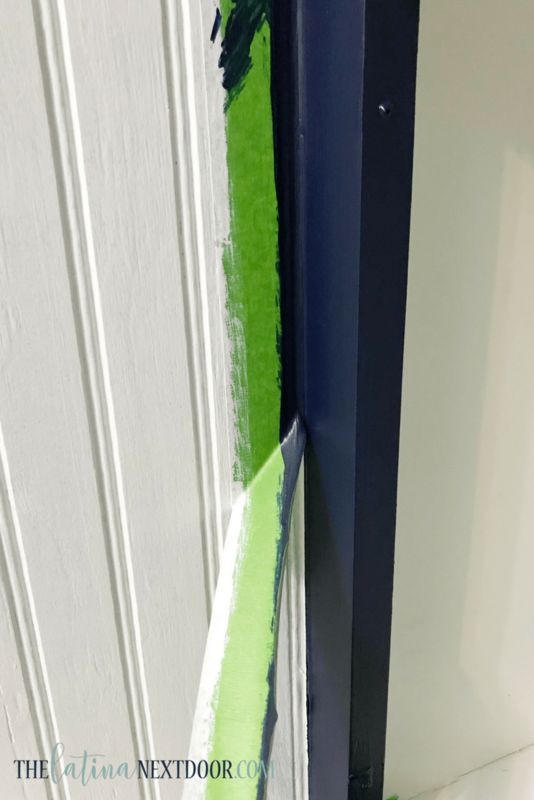 See how the paint looks so different below? 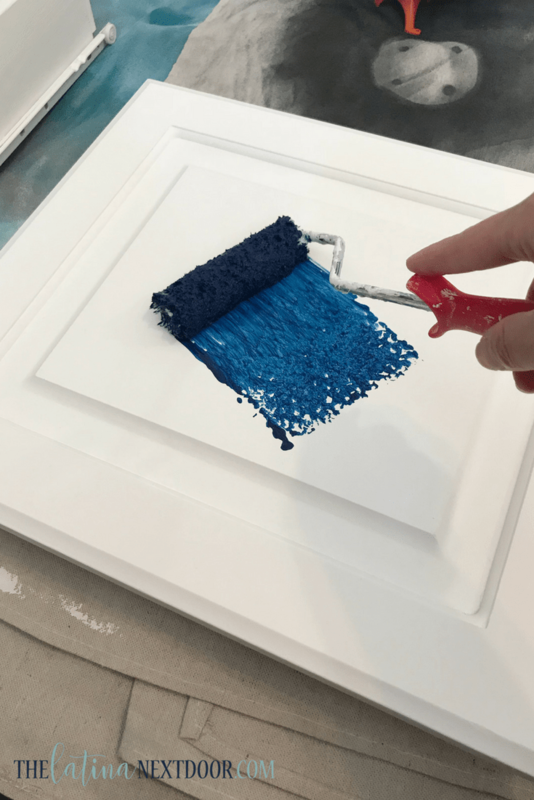 I prefer to use an angled brush when applying Polycrylic because I have found that rollers create bubbles on the surface. Work in long even strokes. You can also sand in between coats. 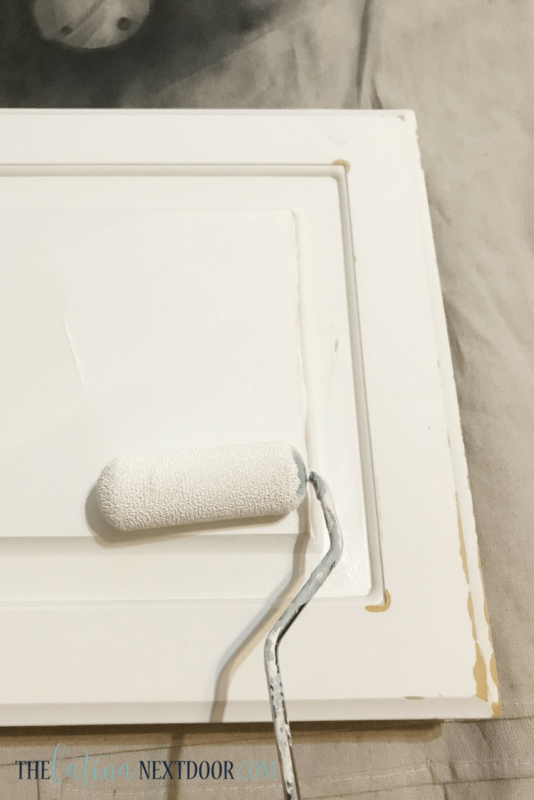 Once all is dry you can remove the painter’s tape, add new hardware on your cabinets and install your light fixture. 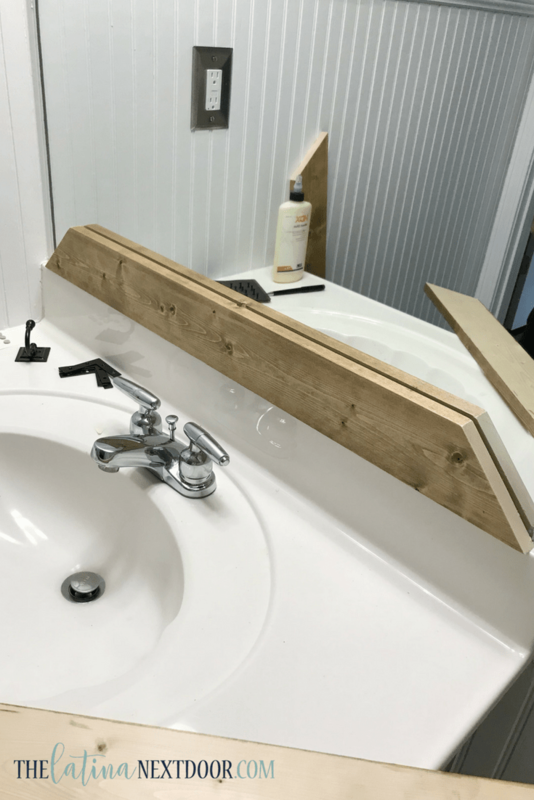 For an added touch, we decided to use wood to frame the mirror. We stained them with Special Walnut Stain. Be sure to seal with your preferred wax or Polycrylic since this is a high splash zone. Cut them to fit your mirror and use liquid nails to install. 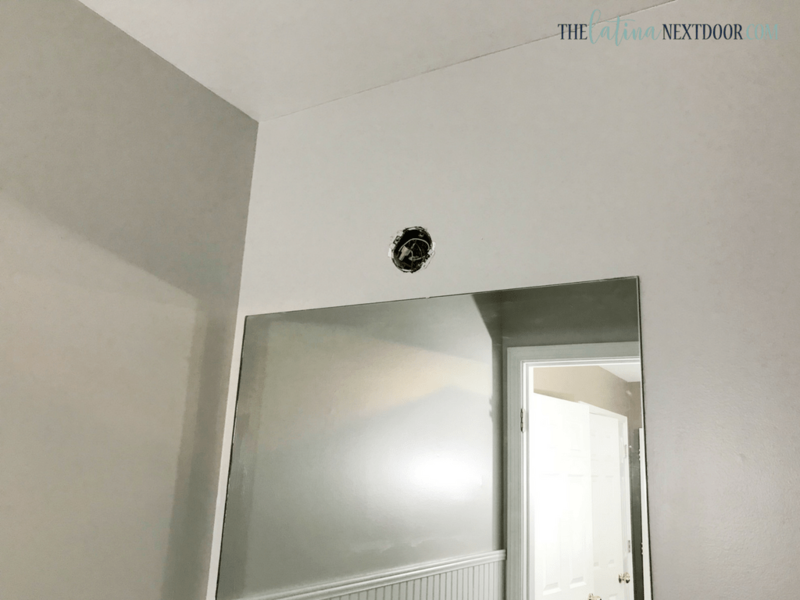 We added small L brackets on each corner that we spray-painted to add a more rustic look to the mirror. 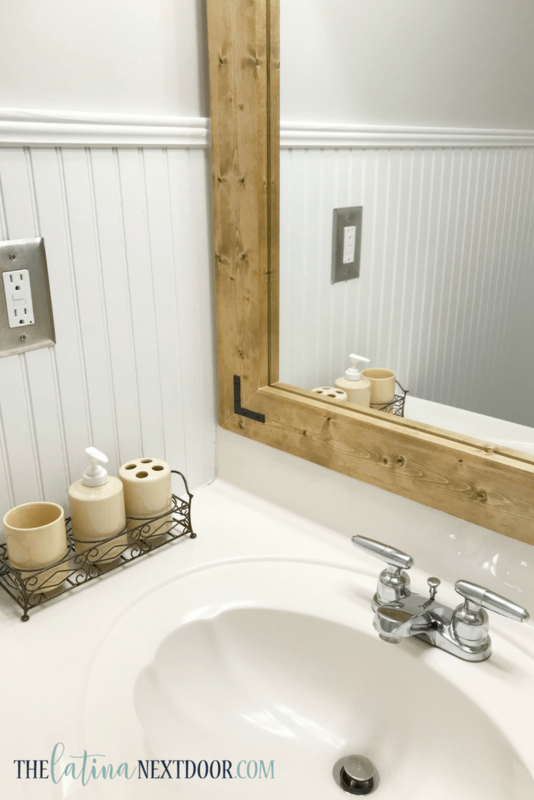 Finally, clear out all supplies, clean the bathroom of any debris and add your accessories to your bathroom! Now, so far this bathroom is pretty bare. 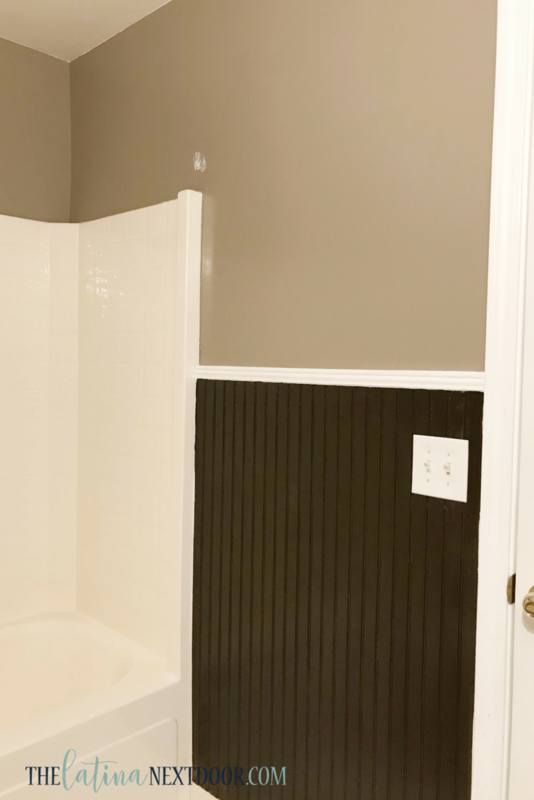 We will be adding some custom shelves over the toilet and a new shower curtain with navy and white stripes…. 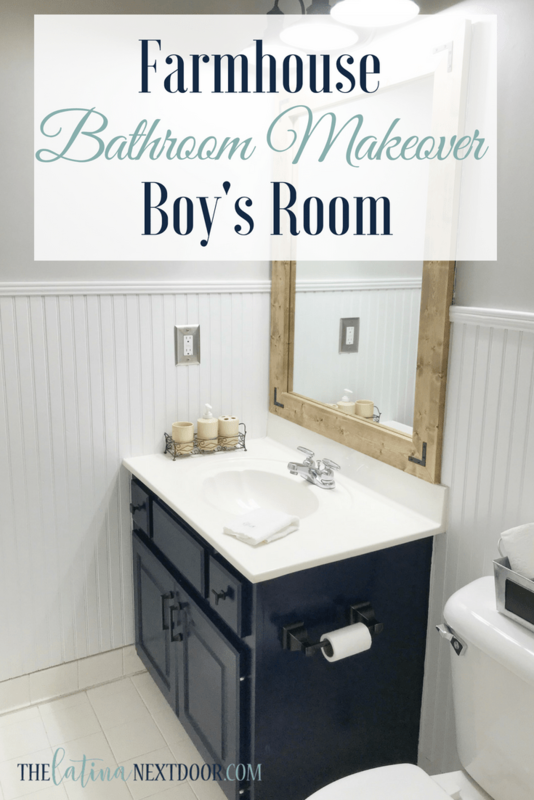 (my son says the bathroom needs more blue). I also plan on adding towel hooks and more accessories. Don’t forget to pin this project if you liked it! But for now I am totally happy with how this bathroom looks! I will be sharing the next updates as well so stay tuned for that! Any suggestions for what I should add? Let me know in the comments below! BTW, I’ve not ever paid attention to National Paint Week. Checking that out! This looks amazing! You did a great job. I love how you framed the mirror. Even with the super dark bathroom cabinet the room is so very light and bright now. Good colour choices for sure! Looking forward to seeing more updates. Cheers!